What it’s about: When Miles enrolls in Culver Creek boarding school in Alabama his junior year, it’s partially because of the last words of poet Francois Rabelaist: “I go to seek a Great Perhaps.” His life has been mediocre at best and he’s ready to expand the scope of his mundane existence. But once he arrives, his life will come to revolve around another set of last words: Simon Bolivar’s “How will I ever get out of this labyrinth?” Specifically, he’ll wrestle with how these words relate to the girl who shares them with him, the enigmatic, gorgeous, mysterious Alaska Young, a chain-smoking, strawberry wine-drinking, damaged but undeniably magnetic girl Miles wishes he liked less than he does. Miles finds himself caught up in Alaska’s vibrant universe as she and her best friend, the Colonel, plan the biggest prank Culver Creek has ever seen. But underneath, Alaska is wounded, and Miles and the Colonel realize there’s no way to know the true Alaska…until something happens that forces them to try. It’s not possible to talk about the second half of the novel, which is simply titled “After,” without giving too much away. I’ll simply say that Green explores another human emotion in detail, and that I’ve rarely seen it so honestly treated. This book was a pleasure to read and it’s the first book I’ve picked up in a long while that I’ve actually felt the urge to analyze. It wasn’t pure pleasure or escape, though it has elements of that as well. It strikes the perfect balance of being engrossing as well as deep and meaningful. Did I mention this is YA? Don’t let that dissuade you. If only all YA was crafted to this level. Green doesn’t shy away from deep thinking, explorations of religion and poetry, and examinations of what it means to be human. His teenage characters have a rawness and vulnerability that adult characters wouldn’t. They’re still experiencing things for the first time, both love and pain. You should also know that John Green is a fascinating Internet personality. His video blogging project on YouTube with his brother Hank is addictive. I actually first became convinced I should be reading his books after watching this video about the editing process, which is a gratifyingly accurate description of what really goes on between editors and authors. As Green points out in the video, most people outside the publishing world (and even some in it) think editors just deal in punctuation and subject-verb agreement, but that doesn’t even crack the surface of what we do on a day-to-day basis. Then, when I learned Green planned to sign every copy of his next novel, The Fault in Our Stars, pre-publication, I sort of geeked out. That’s an extreme undertaking. Especially since his first print run skyrocketed to 150,000 after the announcement. To give you some perspective, a perfectly respectable first printing can be 20,000. So 150,000 of a contemporary YA is sort of insanity. Amazingly awesome insanity. Would I recommend? This is undoubtedly the best YA novel I’ve read in years and certainly one of my top picks for this year of magical reading. As much as I absolutely love John Green (as an internet personality, and as a writer), I can’t say that I found Looking for Alaska that great! I think it was probably because Miles Halter was an annoying character in whose head to be trapped. An Abundance of Katherines was undoubtedly my favourite of his solo novels – I definitely recommend it, if you haven’t read it, yet! Paper Towns was also excellent. 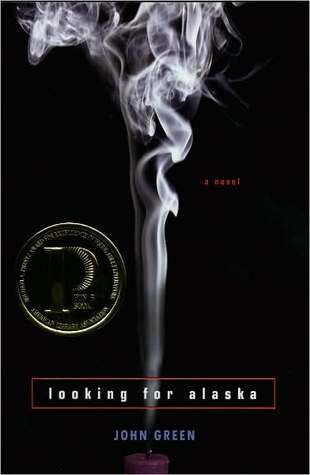 I just didn’t feel as though Looking for Alaska was THAT good!